BUFFALO, N.Y. – There’s nothing like cotton candy or funnel cake on a warm summer night. It’s carnival season in many areas of New York, and millions of families plan on enjoying area carnivals and fairs over the next few weeks. 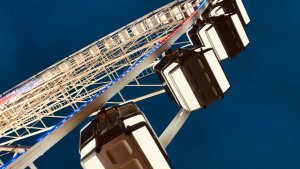 Unfortunately, accidents happen and most people don’t know What To Do If You’re Injured At The Fair Or Carnival. You may have seen the headlines and thought, this won’t happen to me. But carnival and fair accidents affect thousands of people each year. We know this because our legal team has handled many cases involving negligent amusement parks, fairgrounds, and carnival ride operators. The dangers are real. Get Immediate Medical Attention. If you’ve been injured, you need to see a doctor as soon as possible. Statistics show that injuries treated immediately also have faster recovery times. Whether you slipped on a wet floor or were injured by a faulty carnival ride, get medical attention. Document The Incident. Fairs, carnivals, and amusement parks are crowded places. It’s more than likely someone saw the accident that left you injured. Try to get a statement and contact information from witnesses. This will prove to be extremely helpful when obtaining compensation for your injuries. Remember, it’s the property owner’s responsibility to make their event as safe as possible for patrons. Take Pictures. If a faulty ride caused you to get injured, take pictures of it. Be as detailed as possible. If the ride operator gives you a hard time, contact park management. Faulty rides should be immediately shut down, inspected and repaired so that no one else gets injured. Contact An Experienced Lawyer. Not all lawyers have handled cases for amusement park accidents. It’s important to hire a law firm that has not only handled cases like these but won. Cellino & Barnes has achieved several settlements and verdicts for amusement park ride accidents, and our legal team will use that experience to help you get the best result possible from your claim. Questions about amusement park rides, carnivals, or fairgrounds safety? Call our carnival ride attorneys for a FREE consultation.